How to enable your work-space of tomorrow…? Nowadays, it’s the fact that the world is becoming more and more connected. And today’s world is a mobile world. A typical user brings up to four devices to work: a smartphone, a laptop, a tablet, and a smart watch. There is a common point among your mobile devices for working or playing: they are no wired Ethernet ports. This means that all of these devices connect to your wireless network and all of these devices need a piece of your bandwidth. Multiply those four devices with the amount of employees in your organization and you’ll see the problem: there isn’t enough bandwidth to go around. Now add in the data being transferred to and from those devices (a lot of video) and you see where this is going; even more bandwidth bottlenecks. But don’t worry about that. The good news is: The New Aironet 3800 Series and 2800 Series Access Points were designed specifically to break these bottlenecks. The better news is that we’re excited to announce that both the Aironet 3800 and 2800 Access Points are shipping! The Cisco Aironet 3800 and 2800 series Access Points provides bandwidth for IOT devices as they join your network, a great high density experience for open office spaces and allows your customers easy access to your network. 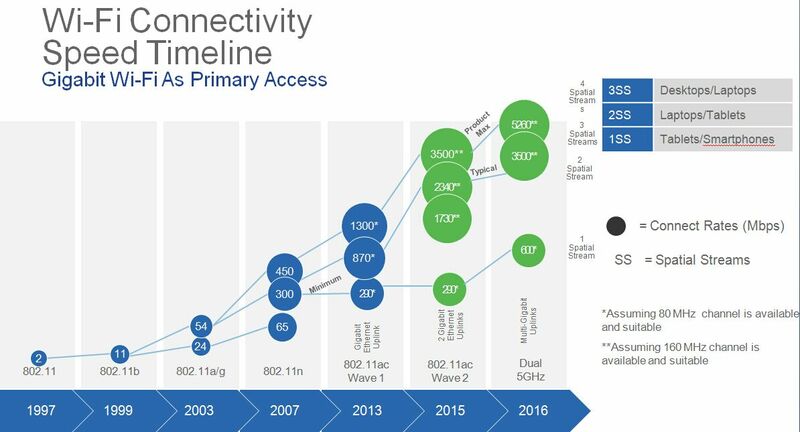 • 802.11ac Wave 2, 160MHz channel support – The industry’s only three-spatial stream that is three times the speed of the nearest competitor. The access point allows up to 2.34Gbps with a single client or 2.6Gbps with multiple clients. When operating in Dual-5GHz mode, the access points provide up-to 5.2Gbps over-the-air. • Multi-Gigabit Ethernet support–With over-the-air data rates approaching 5.2Gbps per access point, you need a backhaul to support these data rates. The Aironet 3800 Series Access Point supports Multi-Gigabit Ethernet capable of 5G, 2.5G, 1G, and 100M. This is the industry’s only 5Gbps capable mGig access point. For a complete Cisco end-to-end solution that improves the overall network experience, directly connect the Cisco Aironet 3800 Access Point to the Cisco Catalyst 4500, Cisco Catalyst 3850, or the compact C3560-CX switches. This will provide Mutli-gigabit speeds throughout your network. 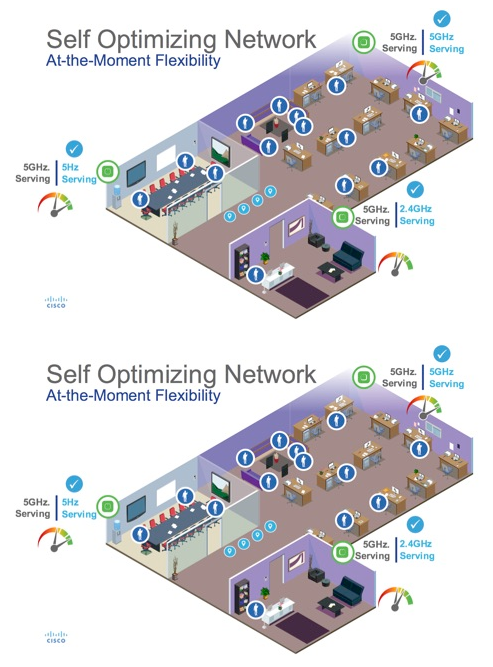 • Multi User, Multiple Input Multiple Output (MU-MIMO) – Supporting three spatial streams, MU-MIMO enables access points to split spatial streams between client devices, to maximize throughput. MU-MIMO provides up to a 1.9% increase in overall performance efficiency. • Flexible Radio Assignment (FRA) – the access points automatically determine the operating mode of serving radios based on the RF environment. Below, a three-access point deployment provides 2.4GHz coverage and 5 x 5GHz radios, focusing on providing capacity and performance. Other wireless providers would need 5 access points to provide similar overall coverage. • High Density Experience (HDX) – Best-in-Class RF Architecture, which provides high performance coverage for a high density of client devices giving the end user a seamless wireless experience. HDX leverages custom hardware in 802.11ac Wave 2 radios, CleanAir 160MHz, ClientLink 4.0, and an optimized client roaming experience to provide an excellent client experience. The Cisco Aironet 3800 and 2800 Series access points are supported on the AirOS 8.2.110.0 code base download the new code now! For more information on the Cisco Aironet 3800 Series Access Points, click here. For more information on the Cisco Aironet 2800 Series Access Point, click here.